I drove home yesterday morning from a wild weekend in Vegas. I’m always tired at the end of a weekend like that, but yesterday I was also stressed (I have been writing that word a LOT lately and I really hope that settles down some in 2018). But more on that later. The weekend was fantastic. I saw friends, rocked out with a couple of different bands, and for a short time, forgot all about anything else and lived in the moment. I do have a list of people to thank and acknowledge, so bear with me. I know that we’ve already thanked these people but I’m doing it again because they deserve it!! Thank you to Noelle Kahn for being a ROCKSTAR and jumping in to help Amanda and I out with selling raffle tickets that night. As we said in our video, logistics at these events are something we tend to forget about. If we’re busy selling raffle tickets and wristbands, it makes it very difficult for us to be good hosts. So thank you X 1000. It was fantastic to meet Durandy for the very first time, and to see Kitty (Gimme A Wristband) again. They continue to inspire and remind me why I do this, even when sometimes I feel like none of it matters to anyone but me. Lisa (I am being vague on purpose, but I hope your feet are doing better than they were on Saturday night when I last saw you! ), both Amanda and I want to thank you for your kindness. I know you probably feel like what you and your friend gave us was just a little thing, but it was not. People will go nuts. However, what we really appreciate even more, are the words of support from both of you. It matters more than I can properly articulate. I feel very lucky to have friends that have my best interests at heart. Those of you who “show up”…whether in person or from afar, matter so much to me. You’re there when I need you, and I just want to look you virtually in the eye, since I can’t always in person, and say thank you. I mean it. You all know who you are. The hugs, the chats, even the quick smiles and waves in passing helped me to de-stress. So glad I got to meet so many friends, readers, and twitter pals! So about that show. Yes, we were in the sixth row, and yes, they were great seats. Nothing I’m about to write should get in the way of that fact. Our distractions of not one but two near-fist fights in the aisle next to us, as well as the constant persistence of people trying to get closer to the stage and the sea of people in front of us who insisted on seeing the entire flipping show through their iPhone as opposed to just watching it with their own eyes definitely provided challenges to enjoying the show. And then there was the family of four – two parents and two very young children – behind me who were very upset when the concert started and everyone stood up. They left after the first two songs, and I felt bad because the wife clearly wanted to stay, but the husband was furious with Amanda and I because we stood up. I saw a lot of the show by peering into the space under the very tall gentleman’s arm in front of me, as he held up his phone to video. I had to laugh, because in the end, it didn’t matter. 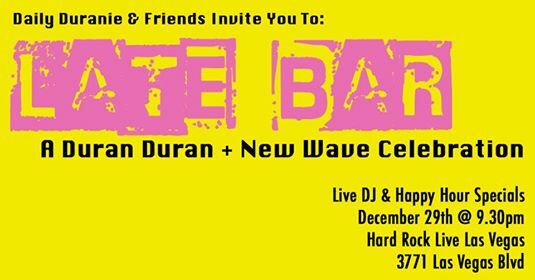 I was seeing Duran Duran live onstage over New Years weekend! I am incredibly lucky, and I know it. I especially enjoyed Hold Back the Rain because I could see the video screen on the wall behind the band, which showed a collage of pictures of a much younger Duran Duran. I won’t even lie about how emotional I felt when I thought about how that was my childhood up on that screen. I still have trouble getting my brain to accept that the people up on that video screen are in fact the same people on that stage…because there’s no way I could ever have gotten even this close (in proximity at a show) to those guys. There’s no way that I could possibly operate a website dedicated to that band. They were the Gods of my teen years. My brain does not compute! If that weren’t enough, the sound was FANTASTIC. I’ve sat much farther back at some shows and yet the sound has been less-than-optimal, even if it should have been mixing well at that point. Of course, when you’re in the front, you hear a lot from the monitors themselves and the sound doesn’t mix well at that point either. However, from where I was sitting this time, it was incredibly clear. Louder than heck, but clear. I had the chance to hear subtle things in the music I hadn’t before. Dom’s guitar part in Hold Back the Rain, John’s bass in the same song, even Sunrise and the tiny snippet of Universe Alone sent shivers down my spine. I loved the show, but there was something else on my mind that night. Right before the show as we stood having a drink in The Chandelier, my sister-in-law texted me letting me know that my niece was in the hospital. She had been going upstairs and suddenly fainted, falling straight back and hitting her head on their tile floor. She is my only niece, and I adore her. It’s the kind of accident that a parent would have on replay in their head forever, because you want to rush to grab them but can’t get there in time. She’s in ICU now with a skull fracture and a slight brain bleed, but the most frightening part is in the process of evaluating her, they discovered an irregularity in her heart beat. It is a little more involved and more serious than I need to explain here, but she is seventeen, and is getting a pacemaker. 2018 needs to be a healthier year for my family. Enough is enough. After the show, I tried to put my worries aside and enjoy the final evening out. Easier said than done, of course. Even with a couple of distractions, I had made the decision to get up early the next day and drive home. By 2am, my exhaustion took over and I went to bed, even though I still had people I wanted to see. It is difficult for me to admit, but this time, the show wasn’t the highlight of the trip for me. Before anyone complains, let me explain. That doesn’t mean the show was bad or that I’m slagging off on the band. In fact, it wasn’t at all. It was just that this weekend, I really needed my friends, people who actually know me, not just the Rhonda who runs Daily Duranie with Amanda, or Rhonda-the-Duran-Duran-fan, but ME. There might not be many people out there like that, but there are some, and I think they know who they are. I have pictures with people I haven’t seen in many years. I received great big bear hugs from wonderful, generous, kind, fans and friends who care about me. Each one filled my heart and reminded me that I belong with this fantastic tribe. Happy New Year everyone. I hope I see many more of you this next year, even if the band doesn’t do many shows. We may or may not have an idea up our sleeve to pass the time … stay tuned.